Health and Human Services Commissioner Jeffrey Meyers talks to the Executive Council Tuesday about the new, five-year agreement with three managed care organizations to administer the state’s Medicaid program. District 1 Executive Councilor Michael Cryans, D-Hanover, is on the left and AG Gordon MacDonald is in the center. CONCORD — The nearly $1 billion contracts with three managed care companies that will administer the state’s Medicaid program are expected to be decided by the Executive Council on Wednesday. The five councilors spent several hours Tuesday questioning Health and Human Services Commissioner Jeffrey Meyers and representatives of the three companies about the contracts. Most of the discussion centered on administrative costs, profits, drug rebates and the percentage of money the organizations spend on medical claims. 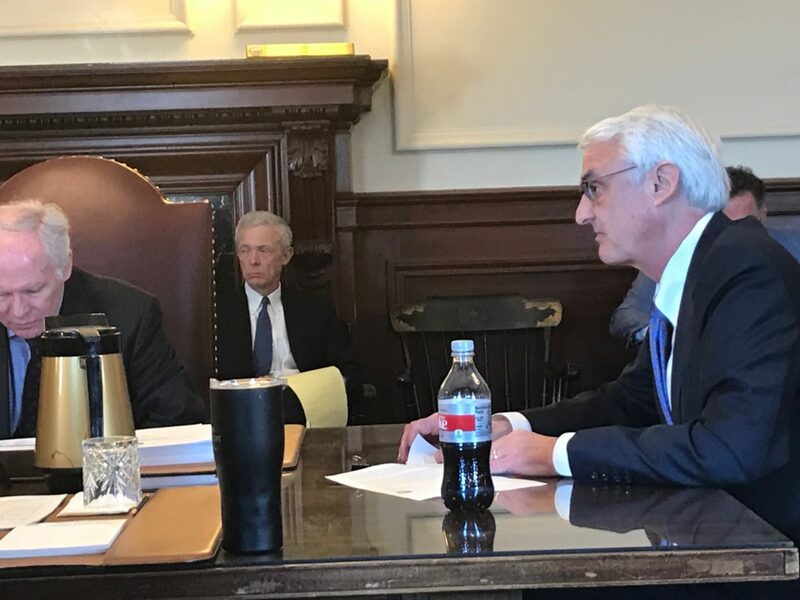 At an earlier meeting with the companies, District 4 Executive Councilor Ted Gatsas, R-Manchester, questioned the 9 percent the companies are allowed to spend on administrative costs under a guideline proposed by the state’s actuary. The contracts will provide medical coverage to the approximately 180,000 people on the state’s Medicaid program. Meyers said the federal government requires the Medicaid contracts to be actuarily sound. He said the actuaries take the program information, past experience and the population served and determine what the rates will be, along with the projected administrative costs and a profit margin of about 1.5 percent. The rate setting is separate from the procurement process, he noted. He said the contracts require additional services from the current contract in place that is held by two of the three companies selected for the new five-year contract. Under the contracts, the managed care companies have to spend at least 85 percent of the premium for medical care, the same percentage required under federal guidelines established by the Affordable Care Act. Meyers said the legislature set the threshold for New Hampshire when it approved Medicaid expansion. If the companies spend less than 85 percent then they have to repay the difference to the department, but representatives of the three companies said they expect to spend more than 85 percent on medical care. At the earlier meeting, several councilors asked about drug company rebates and who would receive them under the contracts. Meyers told the councilors there are three separate rebates, one through the federal government, which is shared with states, a state rebate program tied to its preferred drug list and a separate one the companies can negotiate with drug manufacturers. Meyers said in the current contract, the managed care companies receive the rebates from the drug manufacturers and set the preferred drug list, but under the new contracts, the state will receive the rebates and set the preferred drug list every quarter. Councilor Russell Prescott asked if a managed care company could favor a drug in order to receive a rebate, but Henry Lipman, Medicaid Director for HHS, said there is a working group that sets the list, which may be adjusted every quarter to account for new medications and studies. The three companies selected for the new, five-year plan that would pay them nearly $1 billion annually are Boston Medical Center Health Plan Inc. or Well Sense Health Plan, Granite State Health Plan Inc. or New Hampshire Healthy Families, and newcomer AmeriHealth Caritas New Hampshire, Inc. of Philadelphia. Well Sense and NH Healthy Families currently administer coverage for the 180,000 enrolled in the program, while AmeriHealth is new but was the top-ranked company in the selection process. Several councilors raised concerns last month when the contracts were first on their agenda, because AmeriHealth withdrew from Iowa’s managed care program in 2017 as its largest provider when negotiations to increase rates failed, forcing about 200,000 patients to move to other companies. That issue was addressed at the earlier informational meeting. At Tuesday’s meeting, Gatsas wanted to know if any of the companies were asked to reduce their administrative costs, or profits or return rebates to the state during the bidding process and all said they were not. AmeriHealth’s regional president Russ Gianforcaro said under the bidding process the rates were developed and the company agreed to work within those rates. Other managed care company officials agreed there was no discussion of reducing the administrative costs or profit margin, and that the process was based on the work done by the state’s actuaries. Well Sense Executive Director Lisabritt Solsky said she recalled some discussion about the administrative costs, but it was more whether it was high enough given “the robust set of deliverables” the state requires in the new contract. District 3 Executive Councilor Prescott, R-Kingston, asked the three companies if they would follow the federal guidelines in determining patient care or whether “they would do the right thing” when instances arise. All three said they would do the right thing and not necessarily follow the federal guidelines in order to do what is best for their member and his or her family. The contracts were originally to begin July 1, but under the current time line are expected to become effective Sept. 1. New Hampshire’s Medicaid managed care program began Dec. 1, 2013, after years of fits and starts with three companies, but one withdrew — like AmeriHealth did in Iowa — seven months later. Meridian Health Plan of Detroit, Michigan, withdrew citing its growing business in the Midwest. The company had the fewest Medicaid recipients enrolled in its program when it withdrew. The three companies initially failed to reach reimbursement rate agreements with providers and had a prolonged negotiation with the community mental health system delaying the program for 18 months. The Medicaid managed care program covers medical, mental health and substance abuse treatment services for low-income individuals, families and children, and the disabled, but does not encompass long-term care services such as nursing homes. Generally, the federal and state government share program costs along with counties and school districts. Under the Medicaid expansion program, the federal government pays 90 percent of the cost and the state 10 percent. About 50,000 residents are in the Medicaid expansion program, which began with private insurance coverage, but this fiscal year switched to the traditional Medicaid managed-care system.